This article covers a methodology that you can apply to all your Active email-sending Workflows in your HubSpot account before Revenue Conduit syncs or re-syncs customer data as well as when we import historical data. 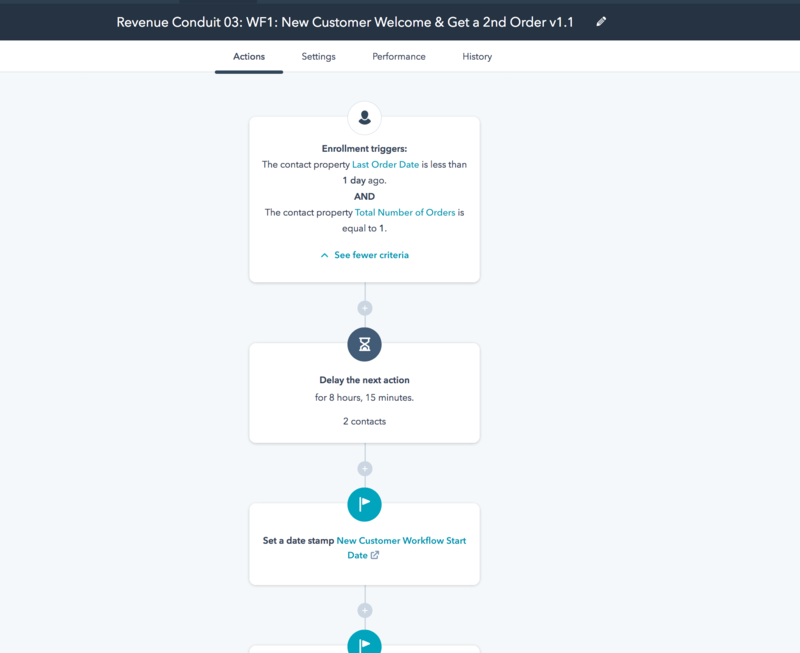 On various occasions and for various projects, Revenue Conduit may need to sync or re-sync historical information from your eCommerce platform into your Hubspot account. Revenue Conduit syncs over 100 properties of information, and since any historical syncs may likely include customers who haven't purchased in several months you would want to make sure that you don't have any Email-sending Workflows or Smart Lists in place that would send emails to those historical customers. We would not want our data re-sync or historical import of your customer data to accidentally trigger emails to those customers if their last purchase was 2,3, or 6 months ago. The reason we give this warning is because Hubspot makes it possible to trigger Workflows and Email automation based on changes in property values, and we’ll update property values in your data re-sync. Please note: This screenshot displays the enrollment criteria that you would add as a condition to your pre-existing workflows so that no one who purchased more than 1+ day ago can enter. Please note that you must check the settings tab and make sure that when a contact no longer meets the enrollment conditions to not remove them from the workflow. You want to keep the selection selection as listed in section 2 of the unenrollment and suppression options.